To be honest, there are not many bands that could celebrate their breakthrough twice. Since their reunion on "Blood Of The Nations" the connection between Wolf Hoffmann, Peter Baltes and the new singer Mark Tornillo became more and more stable. 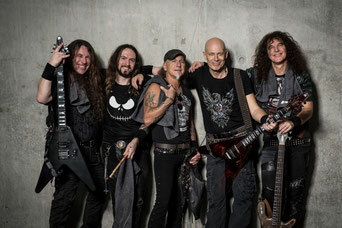 ACCEPT are not just one of the biggest Heavy Metal bands - they are well known being the forerunners of the German Heavy Metal scene. A giant wealth of experience paired with unique virtuousity ist the formular for fifteen successful studio albums. Recently, their master piece "The Rise of Chaos" has been released and reached for the foruth time the Top 5 of the German album charts. On this release ACCEPT proved once more their reputation as a Hard n Heavy pioneer.